God placed man in the world not only in order he would contemplate His works, but also in order he would understand and praise them. In Berlin, on July 25, 1713. Paul Ernst Jablonski was born in Berlin on December 28, 1693, the son of the court pastor and theologian Daniel Ernst Jablonski (1660-1741). He studied in Berlin, in the high school of Joachimstal, then at the university of Frankfurt an der Oder, where he mastered among others the Coptic language from Maturin Veyssière la Croze (1661-1739). His work Disquisitio de lingua Lycaonica published in 1714 well attested his comprehensive knowledge of languages. Thanks to this, he obtained royal support for a three years long journey to Germany, France, the Netherlands and England. In 1720 he returned home and became a pastor in Liebenberg (Mittelmark). In 1721 he was a professor of philology and an extraordinary professor of theology in Frankfurt an der Oder, as well as the pastor of the Reformed community; from 1727 doctor and ordinary professor of theology. In 1741 he applied for an exemption from pastoral duties, and from that time on he only dedicated himself to scientific activity. He was admitted to the Academy of Science of Berlin. He died on September 13, 1757. Besides his exegetic works, church history and dogmatic treatises, his most important accomplishment were his works on Coptic language and monuments, and their application on the linguistic and archaeologic problems of the Old Testament. He also wrote an apology for Nestorians. Some of his most important works: Exercitatio historico-theologica de Nestorianismo … Berlin, 1724. – Remphah Aegyptiorum deus ab Israelitis in deserto cultus … Frankfurt a.d.O, Leipzig, 1731. – Pantheon Aegyptiorum sive de diis eorum commentarius … Frankfurt a.d.O, 1750, 1752. 3 partes. – De Memnone Graecorum et Aegyptiorum huiusque celeberrima in Thebaide statua syntagmata III. Frankfurt a.d.O., 1753. – Institutiones historiae Christianae antiquioris. Frankfurt a.d.O, 1754. 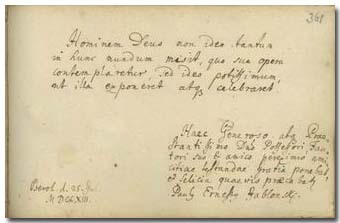 The father of Paul Ernst Jablonski, the Berlin court preacher Daniel Ernst J. had written earlier in the album (p. 121).